Another recipe inspired by something I ate at the very memorable M. Wells Dinette in New York. The simplest of dishes and maybe the most “rustic” one I’ve ever ordered at a restaurant was a seemingly humble plate of carrots. Whole carrots. I’ve ordered sides of vegetables before but they come either chopped and gussied, hidden under sauces or in small portions. To be served craggy, big carrots in all their ugly beauty (well they are both), lying long and awkwardly on a white plate was different. It made me take them in. They were tangled in cilantro stems and lying on a bit of thin sauce that was not emulsified, part oil and something darker and sweet. They were sweet inside and out and soft all the way through but there was spice to ground them and the herbs to lift them and they were so perfect and remarkable that I’m remarking all over the place to you now. I think they were basically this, evenly cooked, totally yielding, carrots in coriander with honey or maple syrup to enhance the sweetness. I haven’t searched to see if they’ve shared this recipe–maybe I’m totally wrong about the ground coriander–I kind of don’t want to know. This recreation takes me back to that lunch so this recipe is everything I need it to be. You are not trying to transport yourself to that lunch by roasting a carrot, you maybe, just want a special carrot recipe, one that will stand out from the way you’ve made them before and this is it. A great side for a roast for sure, but also great on couscous or just with bread and butter, and I’d imagine over a creamy polenta. Or you can tell me how you’d like them for the most memorable experience. 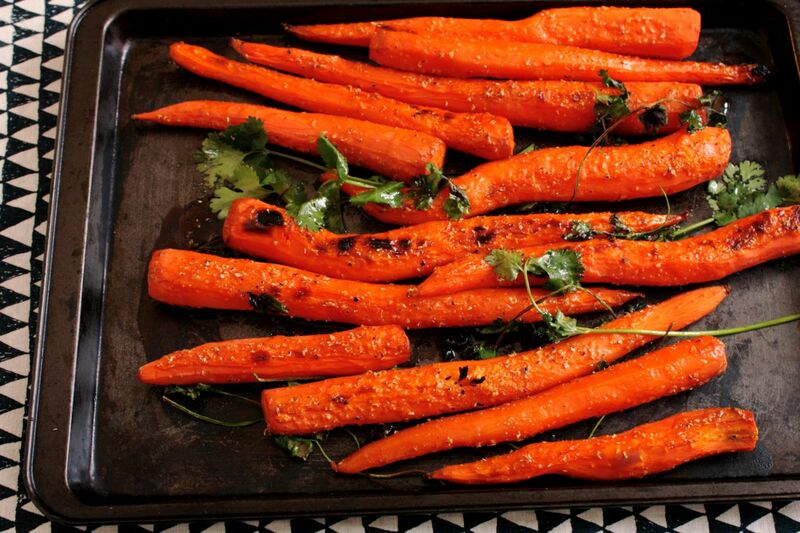 Lay the carrots on a lined baking sheet. Mix the oil, syrup, ground coriander, salt and pepper well in a bowl. Spoon evenly over top of each carrot, covering top to bottom. Sprinkle half of the fresh coriander over top. Broil for 5-7 minutes until the carrots start to turn brown in spots. Remove from oven and add the remaining fresh coriander and toss well. Serve with pan juices either hot or warm.